Faith Erin Hicks graduated from Sheridan College's Classical Animation program and is currently a full-time freelance cartoonist. I first became familiar with her work reading the online comic Demonology 101 (1999-2004). She later collaborated on such works as Brain Camp and Friends with Boys. Her style is unique and evident in all her work. As I was searching for ways to help my students create their own graphic novels, I requested help from Faith on her process. She linked me to her Friends with Boys website which offers step-by-step instructions with visuals for how she goes through her creative process. Her advice helped me work with my students create their own graphic novels as part of a class project. Go straight to the source to check out this professional artist's tips at how to become a graphic novelist! (Note: Scroll past the picture on the to get to the blog post). Below is this author's summary of Faith's process. 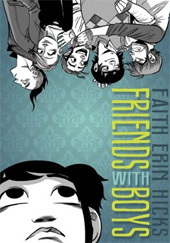 First, Faith Erin Hicks starts her work Friends with Boys by sketching thumbnails. This is her initial script. Other graphic novelists prefer to write out a full script and then make then the thumbnails. 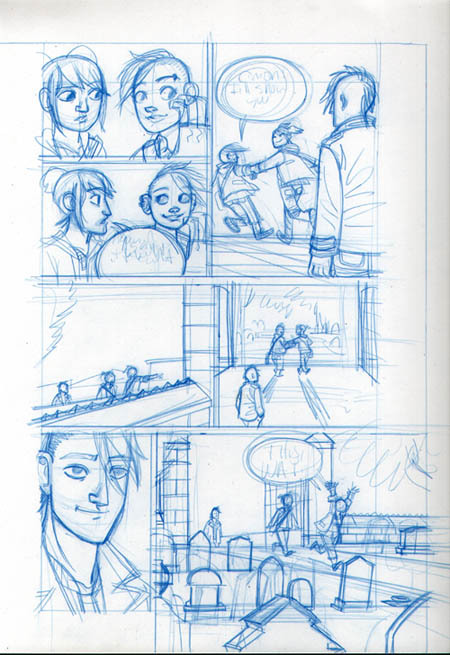 Next, she works around with layouts to get a feel for the possibilities. This is still in the rough draft stage, so changes will occur between here and inking. Then, she gets to the penciling stage. This is still a rough draft, but with the intention of it being the final product. Faith recommends using a draw with a light blue color erase pencil as they are a harder led and will not smudge easily. If you're teaching to a group of students a regular pencil will work just fine if the color erase pencils are not in the budget. Just be sure to remind the students often to draw lightly so they can erase (as they will need to erase until they get it just the way they want it). Finally, Faith Erin Hicks inks her work, making it the final product. She recommends using a Winsor & Newton Series 7 watercolour brush, size 1, dipped in a bottle of ink. Speedball ink is a good choice because it is cost effective. Then, she carefully traces over her pencil lines. And that's the basics from a pro on how to make a graphic novel and / or online comic! All images displayed on this post are Copyright Faith Erin Hicks.